Going On A Trip And Not Sure Where You'll Light Your Shabbat Candles? These Beautiful Shabbat Travel Candlesticks Will Make Your Shabbat Vacation Away From Home A Pleasant And Colorful One, Allowing You To Give Your Shabbat Candles The Proper Place Of Respect. 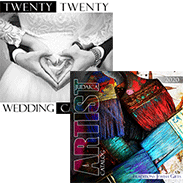 The Candlesticks' Design Features The Gorgeous Vistas Of The Holy City Of Jerusalem. 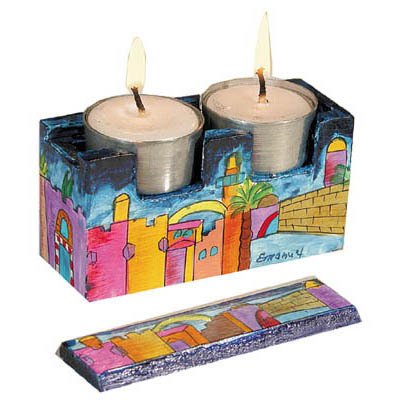 Two Shabbat Tea Light Candles Fit Snugly In The Box With A Painted Top Slipping Over Them To Keep Them In Place During Travel. Once You Get To Your Destination, Just Take The Candles Out, Slide The Top Into A Lower Part Of The Box, And Voila! 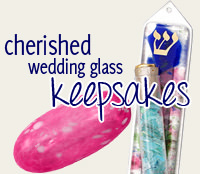 Your Shabbat Candles Are Ready To Go! The Candlestick Set Is Hand-Painted With Acrylics In Vibrant Color, And Is Lacquered To Keep The Paint Fixed And Run-Free So That You Can Bring A Taste Of Shabbat With You No Matter Where You Go! This Fabulous Candlestick Set Is The Perfect Gift For Any Of The Jewish Holidays, Hanukkah, A Bar And Bat Mitzvah, As Well As For Your Friends Who Are Always On The Go. Hand Made In Israel At The Workshop Of The World Renowned Artist Yair Emanuel, These Beautiful Travel Shabbat Candlesticks Measure Approximately 4.2" X 2" X 1.4".